Travelers love taking trips to faraway places, but how often do they miss out on the beauty and fun that can be had in their own backyards? After all, even the most exotic and exciting destinations are just “home” to locals. Vacationing close to home — or taking a “staycation” — eliminates a variety of travel costs, such as airfare, car rentals and lodging. You can relax, have an adventure or get to know your local area better at a low cost. That’s why a staycation can be the perfect solution to cool your wanderlust on a budget. 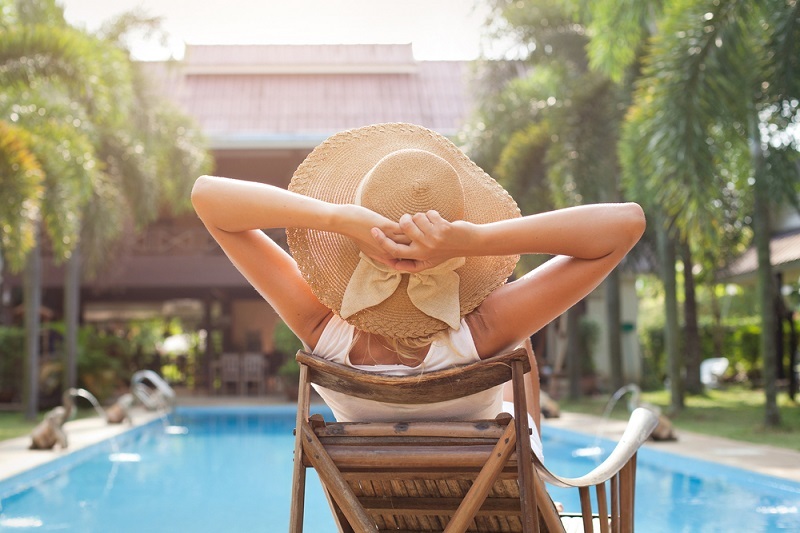 To get the best tips on how to save money while experiencing a memorable vacation at home, GOBankingRates talked to several personal finance and travel experts. See how you can save money by taking a staycation and still have fun. 1. Take a tour of local restaurants. A staycation could also be the perfect excuse to plan a pub crawl of local bars, attend a wine tasting or a tour a local brewery. To keep your eating-out bill from getting too high, hit restaurants up during lunch, which is usually when the prices on the menu are cheaper. Also, take advantage of happy hour specials. 2. Stay in a different part of town. “Pick a hotel at least 30 minutes from your usual neighborhood so you have the opportunity to try new restaurants, shops and activities,” advises Jenny McIver of rtwin30days.com. McIver lives in suburban Atlanta and decided to spend a weekend at a hotel in Atlanta’s midtown/Buckhead area with her fiancé. A staycation in a different part of the city you rarely visit will get you outside your normal haunts. And, you can experience a new place without racking up travel costs. If you’re determined to get out of your city, find a destination that’s not so far away that you have to book a flight. Caroline Trefler, senior editor at Fodors.com, said her most memorable staycation started with a weekend out of town. 4. Book a hotel for one or two nights. Instead of spending a week or two at a far-off destination, a one-day or weekend-long staycation is much easier on your finances. See if you can find a hotel that’s offering deals or discounts. If you live in a popular city for tourists, you might have better luck booking an affordable hotel room during the off-season. One of the biggest perks of a staycation is that, unlike a typical vacation, you’re not leaving friends behind. So, you can use your time off to make quality memories with the people you care about. In fact, perhaps the hotel you’re staying in can make it easier — and maybe even cheaper — for you to host a gathering or party. Although unplugging might not necessarily save you money, you don’t want to waste any of the money you spent on your staycation by being holed up in your hotel room on the computer. Fighting the urge to email and text will help ensure you’re getting the most out of your mini-vacation. 7. Give yourself a break from work. Julie Rains of InvestingToThrive.com has similar recommendations. “To make a staycation truly a vacation, follow the same rules you follow when vacationing: let folks know that you will be out of touch unless there’s an emergency,” she said. Samuel Jeffery of NomadicSamuel.com said that an “I’ll-try-anything-once” attitude can go a long way to making a staycation memorable. “The opportunities in your own backyard are endless, and by adopting a travel mentality you can feel like you’re exploring even though you’re still at home,” he said. 9. Talk to local experts to find affordable things to do. To get ideas on new things to do in your area, ask around. Friends can be a great source of local knowledge, but so can experts. Pavini suggest visiting a local visitors’ bureau for ideas and possible discounts. 10. Be a tourist in your city. You can figure out what touristy activities you should do in your city by thinking “about the top things visitors do in your town, and go explore those that you’ve never actually done yourself,” said Jeffrey Ward of Savvy Navigator. Living in New York City, Ward walked the High Line, saw a couple of Broadway shows and more during his staycation. “We actually undertook activities that we rarely do ourselves but are constantly sending our friends and family out on,” he said. 11. Find deals on passes for local attractions. Going on a staycation is a great way to spend more time at a local attraction, whether it’s a museum, zoo, aquarium or theme park. Chana Schoenberger Zimmerman of MaxMyInterest.com stayed in New York City during the end-of-year holidays for a staycation. “We took the opportunity to visit museums and interesting neighborhoods farther afield and to go to the theater and even the movies, which we rarely do,” she said. Special rates or passes can make these types of attractions more affordable, especially for locals who can visit throughout the year. For example, SeaWorld’s San Diego Fun Card allows local guests to come back to the park through the end of 2015 for the price of a single-day admission. 12. Explore the great outdoors. Many outdoor activities in and near your city are probably free or incredibly cheap. During your staycation, go hiking, biking, swimming, camping and more. You’ll appreciate the nature and wildlife in your city. 13. Plan your staycation around an event. A staycation can be the perfect time to take advantage of events and entertainment happenings in your own city, such as a convention, festival or concert. “My wife and I are based in Pittsburgh, and occasionally we get a hotel and plan a weekend around an event, whether it is a concert or just a night out,” said Stewart. Look ahead, find an event that’s exciting to you, and plan around it. “I read local magazines, websites and local papers that have events and listings to keep on top of what’s going and what’s new,” said Trefler. 14. Browse sites for deals in your city. “One of my favorite money-saving tips is using Groupon, Living Social, Scoutmob, etc. to find deals on services and fun activities near me,” said star stylist Tameka J. Raymond of tamekajraymond.com. A staycation is a great time to treat yourself. Indulge in a spa day, have a massage or get a mani-pedi. The sites Raymond mentioned often feature big discounts on these services. 15. Bring the vacation to your home. Lisa Flowers, founder and CEO of FlowersMediaMatters.com suggested setting a theme for your staycation to experience another culture at home. For instance, if you’ve always wanted to visit Thailand, you could eat at Thai restaurants or visit a museum to view Thai art and learn about the country’s culture and history. You don’t have to travel far and spend a ton of money to escape from your everyday life. By taking a staycation and staying close to home, you can save money while trying new things, having fun and relaxing. This article originally appeared on GOBankingRates.com: 15 Ways to Enjoy a Cheap Staycation This article by Elyssa Kirkham first appeared on GoBankingRates.com and was distributed by the Personal Finance Syndication Network.